This Easiest Pumpkin Cheesecake is a mod to the traditional cheesecake between layers of crescent dough. If you think everything is better with pumpkin, then this is definitely the recipe for you. I may have gotten my hair done this weekend, but my New England roots are showing. I’ve been so inspired – and a little homesick frankly – by the flurry of fall desserts especially ones with pumpkin that I’ve seen. This recipe is adapted from the Cinnamon Cheesecake recipe I got from a friend. 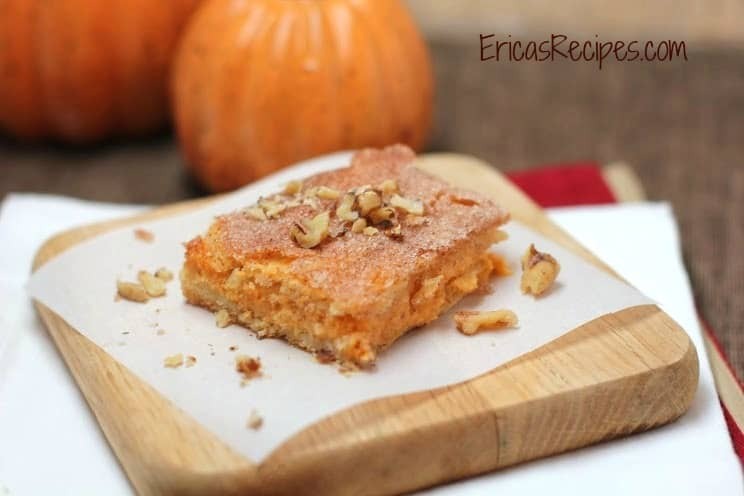 So easy, and now with pumpkin – YUM! In a large mixing bowl, beat the cheese, 1 c sugar, pumpkin, cloves, nutmeg, salt, and vanilla together until smooth. Separately, in a small bowl, combine the 1/2 c sugar with the cinnamon. Line a lightly greased 13×9 baking dish with the dough from one tube of crescent dough, pulling to stretch and pressing together the seams. Layer the cream cheese-pumpkin mixture. Top with the dough from the second tube of crescent dough, again pulling to stretch and pressing together the seams (helps to do this on a cutting board and then transfer it over). Pour the melted butter over top. Lastly, sprinkle the cinnamon sugar over top. Bake 35 minutes or until cooked through. Remove from oven and put to chill and set in the fridge. Serve with chopped walnuts sprinkled over. *Note: in the photos for this batch, I made half this recipe. It was a weeknight and I was only cooking for my family. So cutting the recipe in half, and using a smaller bake dish, works beautifully too! Here’s the first layer of crescent dough…. 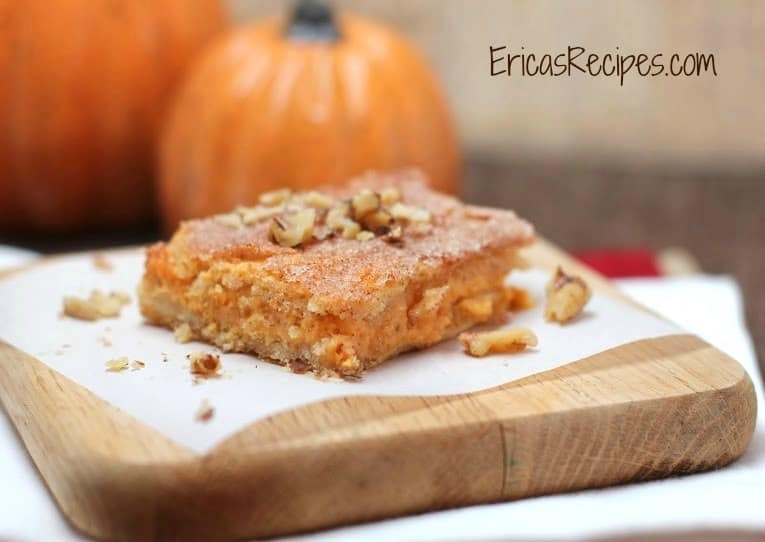 I have a similar recipe and I just love it… You’re so right … It’s pumpkin season! I love Fall for this reason – pumpkin recipes 🙂 You’re being featured at tomorrow’s All My Bloggy Friends! What an awesome idea! I LOVE this cheesecake without the pumpkin…adding it could only make it even better. SO glad I saw this. Pinning!